Experience the 14th annual Empower You Expo 2019! AJ Bodywork is pleased to invite you to attend this year’s Empower You Expo on Saturday April 27, 2019 at the Mountain America Expo Center in Sandy, UT from 10 am - 6 pm. Come discover the possibilities! You can find us at booth #206. EMPOWER YOUR spirit, your health, your mind, and your emotions. Whether you join us for the entire day or just a few hours the Expo is here for you. The Expo is a community event full of practitioners and business owners who are highly skilled in a variety of Healing Modalities that will empower you in every area of your life and business. You will also have tons of opportunities to participate in drawings, giveaways, and win prizes! AJ Bodywork will be selecting 3 names from our raffle applicant to receive a 60-minute therapeutic massage. Imagine an environment away from all the outside noise bringing you down and dimming your glow. Imagine an experience that will lift you up and surround you with people who are there to empower and support you whatever your needs are. The Empower You Expo is a place where you can celebrate and amplify your unique power; no matter who you are or what your journey looks like right now. Have fun away from the negativity of the world, and meet people who can support you on your path at the Empower You Expo. As health coaches and therapeutic body workers, we are constantly asked how to live a healthier lifestyle. We have put together this short video with some tips. Enjoy! Lymphatic Drainage Massage is a hands-on manual pumping and drainage technique used to keep the fluid levels of the body in balance while defending it against infection. The rhythmic touch activates lymph and fluid circulation, filters toxins, and stimulates the immune system. It is a non-invasive approach that can be used to address local swelling or as a total body preventative healthcare approach for optimal wellness. Lymphatic Drainage Massage assists the lymphatic system, as well as the cardiovascular, cerebrospinal, digestive, immune, musculoskeletal, and nervous systems. Why is Lymphatic Drainage Massage Important? The lymphatic system is an integral part of our immune system. It helps the body to defend against pathogens such as bacteria, viruses, and fungi. The system supports immunity by making and storing lymphocytes that produce antibodies to defend the body against disease. The proper functioning of the lymphatic system is critical to our body's ability to detoxify and regenerate tissues. Lymph nodes function as cleansing stations to filter out germs and other harmful substances, and to recover crucial substances like water and proteins. It works tirelessly to remove waste products from our cells and to maintain the purity of the internal environment. If the lymph circulation stagnates due to injury or infection, toxins accumulate and cellular metabolism is compromised. The result is an increase in acid and toxins within the tissues causing pain, tension, and edema. These need to be removed quickly from the interstitial fluid to promote proper tissue healing and restore pain-free movement. What Should I Expect in an Appointment? Lymphatic Drainage Massage will begin with an evaluation, which guides the treatment and helps to measure change and progress. The practitioner then uses gentle rhythmic mobilizations directly on the skin of the neck, head, arms, torso, and legs. These movements begin near the collar bones, where the lymphatic fluids return to the blood stream. From there, they move out to the extremities and back again along the lymphatic channels of the body located throughout the skin. Sessions may vary from 30-90 minutes. Frequency of treatment is based upon the symptoms the client is experiencing. Clients will typically experience decreased pain and swelling along with an increase in relaxation, energy, and mobility. I had the opportunity to sit down with Dave Hansen and Susan Bond from the Murray Area Chamber of Commerce to talk about what makes AJ Bodywork stand out from other massage businesses in the Salt Lake Valley. It was a lot of fun taping the interview, and Dave and Susan where great hosts. 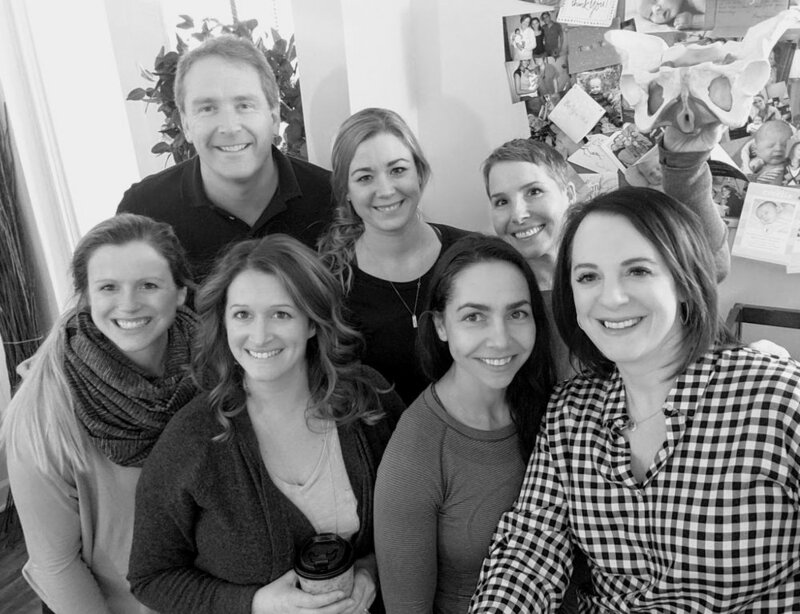 We spoke about CranioSacral therapy, lymphatic drainage, and health coaching. I hope you enjoy the interview. Thanks to MACC for providing such a great opportunity! AJ Bodywork is dedicated to putting you first! We are not a “Massage Factory”. Right from the beginning you will notice we take our time with you and your appointment. We are not in a rush to get you in and out. Amy and Jeremy want to get to know you, and find out what combination of therapeutic bodywork will best address your needs and concerns. We listen, ask questions and make sure you get the individualized attention you need. Every therapeutic bodywork session is unique to the need of the client, not some pre-rehearsed oily flow massage that everyone gets. Our therapeutic bodywork focuses on the areas that you want worked on. Most of our therapies can be done while clothed and you can ask questions along the way or just rest your eyes and relax. Here are some of the bodywork therapies that might benefit you. 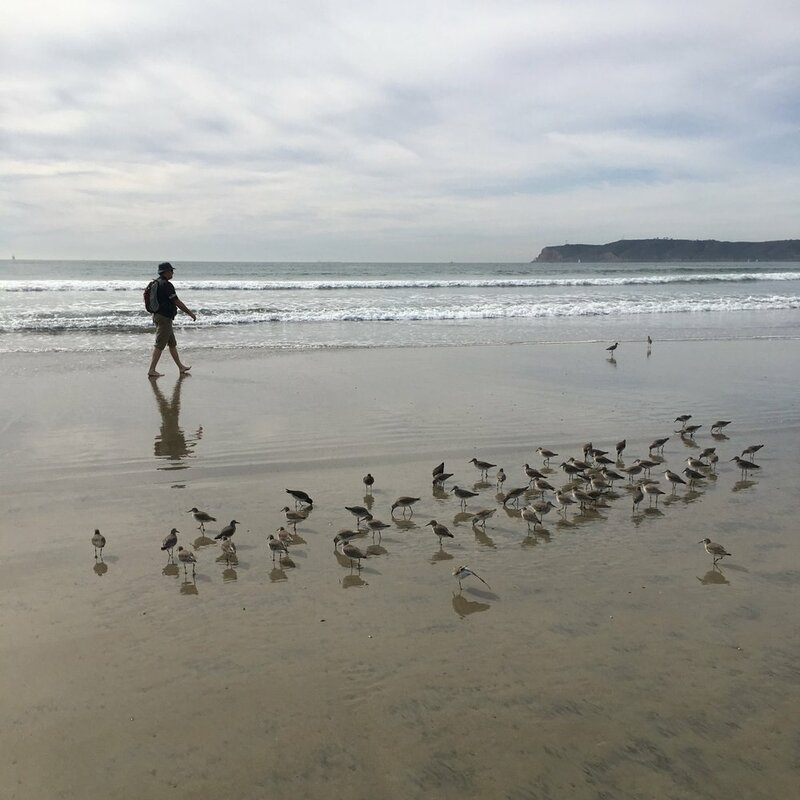 We just returned from a vacation in San Diego where we averaged about 18,000 steps a day, mostly from just walking on the beach. This is 2-3 times what I average daily in my normal routine. What I discovered was that even though I forgot the barrage of supplements I take everyday for joint pain & stiffness, high triglycerides, and more, my body wasn’t actually hurting. I woke up refreshed each morning without medication and without supplements - ready to tackle the day - pain free. As I meet with individuals each day in my practice, I preach the importance of movement. During lymphatic drainage massage I tell clients that movement is one of the best ways to move lymph. Lymph is a tissue fluid that acts as your body's garbage disposal system by removing toxins from the body. This system is dependent of muscle and joint movement to pump itself upwards to the subclavian veins in the base of your neck. The majority of lymph nodes (recycling centers) are located at your joints to receive the benefit of this pumping action. The Arthritis Foundation teaches us that “exercise gets the heart pumping, which increases blood circulation throughout your body – including your joints. As a result, the synovial membrane is exposed to a steady supply of nourishing oxygen and nutrients.” As I work with those that suffer from arthritis with CranioSacral Therapy, I see what inflammation can do to the body and how crippling it can become. Movement that increase strength and flexibility at the joints can help combat fatigue. With my foot zone therapy clients, not only do I explain that every system & organ is located on your feet, I often talk about how many of the body meridians are located on the foot and with walking or other movement we are stimulating pressure points that aid in health. There are so many reasons why we should be moving every day. I have never doubted that. This vacation really gave me an ah-ha moment on what it can do for me personally. Juicing is a part of the health journey we began together almost 5 years ago. We have been able to tell a difference in the way we feel and perform on days we drink juice and days we don’t. We are amazed by all the health benefits found in fruits and vegetables. Anti-aging, antibiotic, anti-cancer, anti-depressant, antihistamine, anti-inflammatory, antioxidant, and more. As we enjoyed a glass of freshly juiced produce this morning, we decided to start sharing some of our favorite recipes. Eye conditions are often a reflection of the health of the body as a whole. We have had several clients come in this past month with concerns about eye strain and headaches. Here are some acupressure points found around the eye that can help alleviate the strain. You can practice them daily or use them when needed. We also recommend drinking lots of water, daily juicing, and managing your stress to help with eye strain. Complimentary massage with purchase at Athleta Fashion Place on Black Friday and Small Business Saturday. Join AJ Bodywork in store from 10-12 and 2-4 each day. We can answer any questions you have about massage modalities as well. Join us for the annual Cottonwood Heights Business Association Trunk or Treat! During one of Michael Morgan’s longevity classes, he demonstrates the application of the still point on Jack Canfield. The still point on the central nerves system is like rebooting your computer. The temporary build-up of cerebrospinal fluid then breaks free and is able to break up plaques and allow for freer movement in the brain. Mark C. talks about his experience with CranioSacral Therapy, Lymphatic Drainage, and Foot Zone Therapy. He visited AJ Bodywork weekly over a 3 month period and these are his results. The Senior Expo will highlight Genealogy, Health Screenings, and Senior Care. You can get more information and register at www.seniorexpo.org. Health Screenings will include blood sugar, diabetes & sleep apnea pre-questionaries, bone density, dental & eye care, hearing & balance, skin sun damage check, and more. Fun Run & Yoga - It's Self-Care Awareness month. 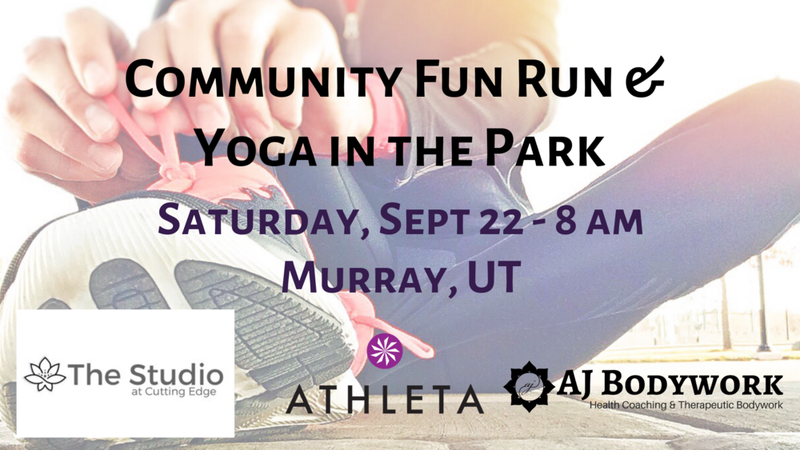 Join us for this free event Saturday Sept. 22 at 8am starting at The Clock Tower Building @ 308 E 4500 S in Murray, UT to walk/run to Murray Park. We will host a yoga class in the park. All ages welcome. Fun prizes. Ladies!! Bring your girlfriends for ladies night this Friday at 7 pm. Come enjoy 30 minutes of boxing led by @titleboxingcottonwoodheights and Twerq from So You Think You Can Dance Choreographer @iamnaomip @twerqofficial No dance skills required. Have fun while burning calories. Cost $20.00 with wraps and $15.00 without wraps. There will be a live DJ, food, giveaways and fun! Come enjoy while supporting local. We have always said that there is something for everyone in Qigong. Qigong teaches us to notice the nuances of our body's energies. It can help at any age or shape. This week we had four generations of the Walker family (ages 17-95) join us for our class. Each move can be catered to what you are capable of. It assists with breath work, movement, and meditation. Qigong classes are taught at The Studio @ Cutting Edge every Tuesday at 6pm and every Wednesday at 2pm. 308 East 4500 South, Suite 210, Murray, UT 84107. 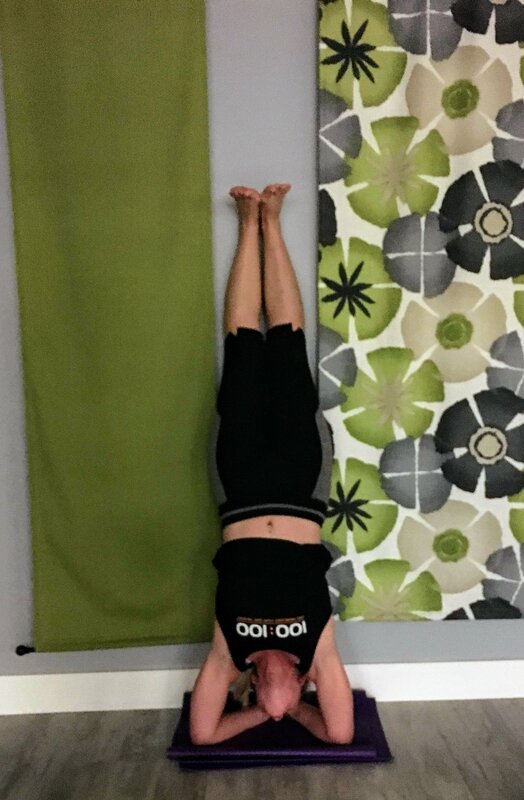 We had the opportunity to attend a yoga class taught by Robin at The Studio @ Cutting Edge yesterday with Adam & Michelle from Amplus Family Chiropractic. It was full of laughs and fun while we got good stretches in and energy in our souls.